Ok, so we have a new formation. The kit gives us a Riptide and six broadsides battlesuits. But it also aligns with the new dataslate product GW has available on the iBookstore. This dataslate outlines rules for using these units as a formation or detachment in regular games of 40k. You have to run all six Broadsides AND the Riptide in your army, and in return you get the "tank hunters" and "preferred enemy: Space Marines" special rules. May not seem like much, but preferred enemy gives them all the ability to re-roll failed to hit rolls of 1 (against Space Marine units), and tank hunters allows you to re-roll armor penetration rolls (either for fails or to try and bump a glance up to a pen) against vehicles (not just Space Marines on this one). Downside, it gives Space Marines hatred against the unit. This means they can re-roll failed to hit rolls against units in this formation during the first round of close combat. That could be ugly, but let's be honest, Tau in close combat is always going to be ugly. That's why our definition of close combat is "30 inches." SO, you can download the dataslate for less than five bucks (I think it's US $3.99 in the Apple iBookstore) or you can get the info out of the new Escalation book (at least that's what the guys in my local store tell me). 1) These detachments can be taken by anyone using the allies matrix (I do need to verify this when I get my escalation book). I do not like this, in fact, I am a prude. I do not like looking across the table at Tau allies and detachments. I tend to avoid these games, and as only one or two other players at my local shop run any Tau at all, there are plenty of other players for me. 2) Mmmmm... tank hunters. And without having to waste a crisis commander in the unit. 5) I could run a Farsight army with O'Vesa and bring this detachment. Elites would be three other riptides, giving me five of these puppies on the table. With crisis suits as troops and an HQ Farsight bomb as my hammer... scads of marker, gun, and shield drones in Fast Attack, and more Broadsides and a Forgeworld R'Varna in HS, that is my suit army. Might be weak against some of the heavier armor like land raiders and monoliths, but not all armies have that, and this would be one hell of a fun list. I do not seem to have the Farsight update in my Army builder... so I don't know the points for this, but I will update this later when I verify the rest. Hey, write me and let me know what you think! Here are my thoughts on it; very similar to yours in many respects. This is practically going to be an auto-include for me. Broadsides with Tank Hunters? Space marines can have hatred, S10, and instant death for all I care. If you run this unit plus longstrike, suddenly your entire heavy support has tank hunters along with a tank hunting riptide to boot. Absolutely worth it. 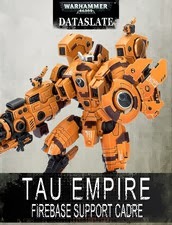 You could fit in 5 Riptides if you allied in a Tau Empire Riptide and support commander. The nice thing that this does is you don't have to ally in Tau Empire. At enigma, true, but in that case, you could fit six. The five in the Farsight list I mentioned, and then the allied contingent could bring one more in its elites slot. Then again, with a double Force Org you could bring nine or more. The five in the original Farsight list, three more in the second FOC elites slots, and then another in a second Firebase Support Cadre attached to the second FOC. But come on, nine Riptides? I love the model and its rules, but that's would cross the line of "a little silly." True by nine might as well paint them all up as Gundams. Hmmmm..... Has anybody else experienced "tau hate". This really isn't going to make us any more popular with our opponents. I have really mixed feelings about this. Sure it's powerful, but do we really need even more powerful units. OK, I just noticed that you can take more than one of these. This is just stupid. How much fun would it be to play against a list with an ethereal, a bunch of kroot and 3 or 4 of the Tau formations. And don't even talk to me about the new escalation expansion. My only hope is that TO's start to "comp" tournaments to exclude this nonsense.